CBS8 reports that the Peninsula Planning Committee’s decision last night – May 16th – to find a compromise on the “bogus” stop signs continues to divide and rile the local hilltop community in Point Loma. The Committee voted 4 to 3 to send a recommendation to Councilmember Faulconer’s office that the controversial stop signs that appeared and installed by anonymous parties, outside of city regulations, will be replaced – there’s 2 of them – and that 3 official stop signs in the area be removed. The Planning Committee had been directed to come up with a solution for the problem and send Faulconer a recommendation. Faulconer in turn is supposed to send it to Mayor Filner. No specific timetable was set. Several Committee members recused themselves from the final vote for a number of reasons, including inexperience with the issue. The vote was not what many in attendance were expecting. Some wanted the new signs to be replaced with the yield signs that once stood in their place, while others wanted the new, amateur signs to stay up. Speeding drivers have been a concern with a particular Point Loma neighborhood since at least 2000. … Another group of residents feels the additional stop signs pose additional dangers for drivers unaccustomed to seeing them. … Residents say the stop signs were likely put up after some grew tired of waiting for the city to address an issue with speeding drivers along a sharp curve near Jennings Street. There are currently five stop signs within a 150-foot radius near Jennings Street at Albion Street and Silvergate Avenue. 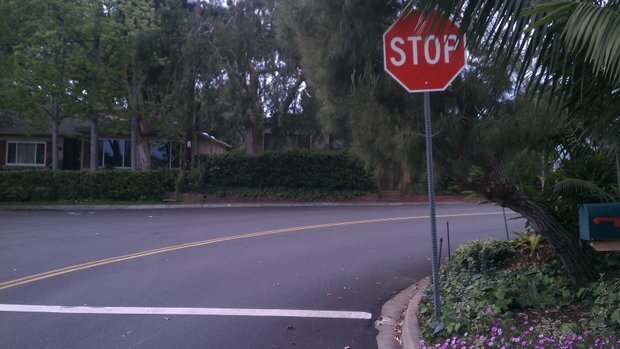 Two bogus stop signs have been discovered in the tony neighborhood of southern Point Loma, near the Point Loma campus of Nazarene University. In July, 2012, a stop sign appeared on Jennings Street. The counterfeit signs have many supporters among local residents, and even the City signed off (no pun intended) on one of them – but, not everyone is happy. Residents along Jennings at Albion Street and Silvergate Avenue are divided on the issue. Some say the bogus signs have made their neighborhood more safer for pedestrians, children, and walkers. But others are not happy. A group feels that the City, by okaying the counterfeit signs after-the-fact, has approved of the removal of its yellow yield sign and its replacement – all based on wrong facts. … The issue of the stop signs went to the local Point Loma planning group, called the Peninsula Planning Committee. Removing stop signs is illegal, but City policy allows for such signs if the local planning group approves them and they also get the okay from a council member. And in January, the Peninsula Community Planning Group voted in favor of the stop sign. Faulconer also gave his approval. Yet those local residents who oppose the stop signs claim that the Councilman and the Point Loma planners were ignorant of important points. They claim that a petition that was circulated around and then presented to authorities with a hundred signatures actually included less than 50 locals – with most not living in the area. They also allege that Faulconer’s office and the planners didn’t have the correct info on who actually installed the signs. And this brings us back to what happened last night at the Peninsula Board. 700,000 auto crashes occur annually at stop signs. They are a disaster for the environment, quality of life, and health. Our fair city allows anyone to complain and the city will install a stop sign. There is no mechanism to have a stop sign removed. More stop signs translate into more accidents for many reasons. One is stress. Having to stop and start twenty times on the way to work is stressful. Most drivers give up and just run them. Accidents and deaths increase. Holland is dismantling almost all traffic signs and is getting a lower accident rate. Wear and tear on autos and pollution is staggering. A single four-way stop can cost 200 gallons of gas a day. Brake linings wear and release toxic copper and asbestos dust. When a car accelerates it is at maximum emissions – NOx and HC. Most cities recognize that over-use of stop signs is very dangerous. San Diego is harming its citizens by overuse of these devices. At some point a law firm will realize what San Diego has inflicted on its citizens and will sue the city for hundreds of millions. Read the facts.